I have been involved in dogs all my life and felt I always had a special connection with them. Before becoming a full time dog trainer, I trained and competed in obedience as well as conformation with many dogs receiving championships. It was exciting but I felt like there was something missing. There seemed to be a disconnect in the foundation of the relationship as a whole between the human and K9 from the dog’s perspective in day to day life outside of the show ring. I saw so many families having struggles living with their dog “I can’t walk my dog – he pulls me on leash – I walk my dog at 4am when no one is around – he reacts to everything”, “he jumps up all the time – I can’t have people over – I’m feeling like a prisoner in my own home”, and I wanted to help. I knew if these owners didn’t get help their dog was going to end up being given away, dropped off at a shelter, or worse. The families loved their dog but just didn’t know what to do. That is when I realized my purpose. Help families live in harmony with their dog through education to keep dogs in the home. Shelters are overflowing and rescues are being buried alive in an avalanche of dogs being dropped off or returned. I knew stopping the avalanche was impossible but if I could make an impact I would be helping. That’s when I decided I would dedicate my career to helping families. When I decided to become a dog trainer full time, I wanted to become certified and researched schools all over Canada and the United States that I could possibly attend. I quickly learned that the Government does not recognize dog training as a certified profession (like a doctor, dentist…) which meant anyone could become a “Certified” dog trainer by just paying money and taking an online course without ever having worked with a dog. How was I going to help families without training with someone 1 on 1 or handling dogs to gain experience? I felt defeated and had to decide that if I was going to make a real impact with my purpose of helping families I was going to have to go down a different path of learning than other trainers but had no idea where to start. That’s when I stumbled upon Training Cesar’s Way at the Dog Psychology Centre in Santa Clarita, California where you could attend a 5 day course working 1 on 1 training with Cesar Millan who’s philosopies made sense to me and worked well with my own personal dogs. I decided that I would invest my business start up on knowledge and experience over certification. It was in May of 2013 on my 40th birthday when I first met Cesar. What a great way to spend my birthday! Training at the DPC with Cesar opened up many doors for me to meet and work with dog trainers from all over the world. It was through Cesar that I met my friend, mentor and world renowned trainer, Heather Beck of K9 Lifeline.o I trained with Heather 1 on 1 at her facility in Draper, Utah in 2014 learning how to work with difficult dogs, how to properly socialize and rehabilitate dogs as well as how to use e-touch (ecollars) to create a positive, fun experience for owners and give freedom to their dogs. Since 2013 I have worked with over 1500 dogs from happy go luckies to reactive cases. By working with so many dogs I am seeing patterns of behaviour, why dogs do what they do, what is lacking in the relationship between owner and dog that is preventing success, and how to bridge the gap between the two species – Dog and human. Every dog teaches us something new and education never ends. I believe in bettering ourselves through learning and experience not only in dogs but with other species as well. Training with Rick Quinn in a Hosemanship Clinic who trained with Buck Brannaman was a great experience for me to see how our philosophies and training approach with dogs crosses over to other species. I am a member of the International Association of Canine Professional (IACP), The Canadian Association of Pet Dog Trainers, Canadian Kennel Club, Portage Kennel Club, German Shepherd Club of Manitoba, and German Shepherd Club of Canada. I still breed and show my top quality German Shepherds through Longburn German Shepherds for conformation and family companions. I will forever be grateful for the support and knowledge that I have learned in the psychology of dogs and how to create harmony between human and K9 through Heather and Cesar. Ever since I can remember, I have always been intrigued by animals and how they think. As a child when I would visit farms with my family, I could be found with the animals studying their behaviour and what makes them comfortable around me. I learned a lot from the farm animals as well as stray animals that I would come across in my home town. Through these life experiences on the farm I learned that animals are a gift and a privilege who speak the same language, have the same learning styles and needs of dogs. Helping dogs that are fearful, nervous, or anxious are my most rewarding dogs to work with. Being able to free a dog of angst and helping them see that the human world isn’t such a scary place is a powerful feeling. My approach is to be the translator between dog and owner to offer clear communication so that both understand each other needs to reach a common goal. With clear communication dog and owner can achieve any goal by truly supporting each other’s needs by not only succeeding individually but also as a team. I love being able to strengthen the relationship between dog and owner where the world of possibilities opens up. In 2014 I was looking for a dog to join my life that was naturally fearful to challenge me to further my knowledge with dogs. When I found the right dog (Charlotte) I started to get to work and implemented all my knowledge and the teachings of others I had researched. Cesar Millan’s philosophies connected to my own experiences and knowledge. I began to research and implement many of Cesar’s teachings regarding similar cases of dogs with fear-based issues. I made great progress but still was missing a piece of the puzzle as I wasn’t able to reach the goals I had in mind with Charlotte, so I knew I needed some professional guidance to get me to the next level. That’s when I found Debbi McArthur Owner/Founder of Prairieburn K9 Academy and signed my dog up for her Board and Train Program. I was quickly able to achieve my goals with Debbi’s guidance and she very quickly became my mentor. I started to attend many of Debbi’s workshops and assisted her with training dogs in her care. I was excited to join the Prairieburn team and become a contract trainer when Debbi moved with her twins to BC where they attended hockey school and she pursued her business. In 2018, Debbi and her family moved back to Manitoba and she offered me the opportunity to own the BC Division of Prairieburn to continue to grow the business and support our existing clients. In May of 2018 I officially became the Owner of Prairieburn K9 Academy – BC Division. Continuing to learn from all dogs and dog owners I work with is really important to me, as I always strive to be better tomorrow than I am today and I believe learning should never stop. I have worked with over 500 dogs since meeting Debbi with a variety of different behavioral issues and am excited to continue to my journey helping dog and owners. Jessie Lavallee, owner of Prairieburn K9 Academy, Pembina Valley Division and owner of A Furry Tail Ending in Altona, Manitoba specializing in all pet grooming, structured dog daycare, raw pet food sales and pet photography. She started her career in the dog industry in 2012 at one of Winnipeg’s most prestigious dog grooming facilities working as a dog daycare attendant then moved on to train as a professional dog groomer. She was trained by some of Canada’s top dog groomers and became a Certified Canadian Professional Pet Stylist. Jessie met Debbi in 2012 while they were competing in the German Shepherd show ring with their half brothers Cash and Oakley. Oakley has competed in obedience, sheep herding, agility and is a Certified St John Ambulance Therapy Dog. 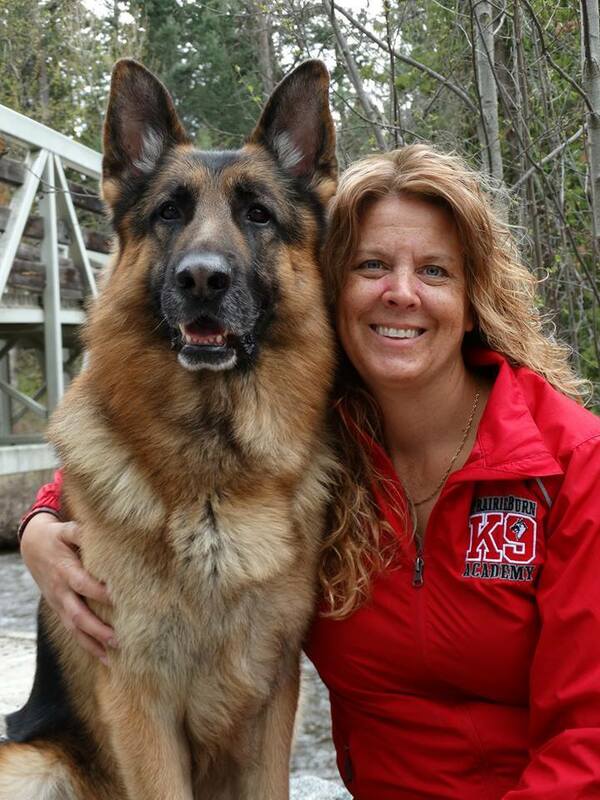 Jessie has been mentored over 5 years by Debbi and has now joined the Prairieburn K9 Academy team!